Read more about the School’s Gambia project in the team’s journal. The 2013 Gambia expedition team, made up of twelve Upper Sixth pupils and three WGS teaching staff, returned home just three days before Christmas, having spent a week in The Gambia, West Africa. At lunchtime on Saturday 14th December we met at Manchester Airport to set off to the Gambia and at that moment I don’t think any of us fully understood exactly what we were going to experience on our week long trip. We were well equipped with everything from life jackets to bubble blowers for the children in our bags, prepared with lesson plans and design sketches for painting and extremely excited for what lay ahead. Upon arrival we met Mr Lamin Jammeh who runs the projects Withington is linked to in The Gambia and who looked after us for the week we were there. Whilst in The Gambia we were constantly busy with activities, the first of which was a walk around the capital city, Banjul. Having arrived after dark the night before we hadn’t really observed much outside of the tourist district of Kolioli and this added to the staggering contrast we found between the levels of development there and in Banjul the next day. It was easy to imagine how you could visit The Gambia and never truly see the everyday reality of the country beyond the sanitised façade of the tourist district. As well as a strong sense of perspective our trip into Banjul also brought us our first (of many) encounters with local children who attached themselves to Isabel and Naomi. We then moved on to the main purpose of our trip and set off up country to the village of Illiassa, home of Mama Tamba Nursery School. This involved getting up at 5am and travelling by jeep, a ferry across the river and finally by donkey cart. We had spent the year in the run-up to our trip fundraising for a new kitchen and storeroom to be built there and had immense fun painting both the new rooms and an older classroom. After a bit of difficulty painting new plaster, due to it being too humid for the paint to dry, and getting thoroughly covered in whitewash we were able to paint Ellie and Isabella’s designs on top. We had met some of the children who attend the school when doing the painting but the next day we were back to teach the lessons we had planned and so spent much more time with them. There were different age groups in each of the three classrooms spanning from ages 3 to 8 and the help of their teachers was greatly appreciated in the making of bracelets, crowns, wooden puppets and musical instruments. After the children had each made one of these we then moved outside to play games. This began with a version of Blind Man’s Buff led by the headmaster Tamba and ended with us running the Hokey Cokey, which proved very popular. Shortly after this it was time for us to leave Illiassa and travel back across the river by canoe, however all of us were sorry to leave Mama Tamba and the children as they had been incredibly welcoming and friendly. The journey across the river yielded beautiful scenery and a lot of wildlife, the highlight being the black dolphins the captain spotted on the main river. We spent that night at Tendaba Camp where we all had much appreciated showers and Esther showed off her remarkable dancing skills. In the morning we headed off towards My Farm, a sustainable farming project, where an agricultural college student guided us around the site and provided Isabel with lots of useful information for her EPQ. We also saw the making of eco-friendly soaps, which many of us purchased as gifts for friends and family. We then headed back to the hotel and the next morning on to the sacred crocodile pool in Bakkau and all, teachers included, stroked a crocodile. The belief associated with the pool is that bathing in water from there can cure a woman of infertility and if it does the child conceived must be given the nickname that signifies this. Our final visit whilst in the Gambia was to Lamin’s family compound and then to a graduation ceremony at a computer centre that Withington is a joint sponsor of. It was very interesting to see how Lamin lives with his extended family and we were all very taken with the 1-month-old baby who is the newest addition to their family. The Gambia trip was an amazing experience into a different culture and way of life. The strongest impression of which, for me, was a striking ability to cope with adversity whilst remaining positive. No matter where we were, from the streets of Banjul to the rural villages, there was vibrant energy (and lots of shouts of ‘taobab’, meaning ‘white person’). It was an extremely humbling experience that gave a sense of perspective, which will last long after the trip is over. The Gambia lies close to the bottom of the UN’s Human Development Index, ranking 168th out of 187 countries. Life expectancy is only 58 years and children receive an average of less than three years of schooling in their entire lives. 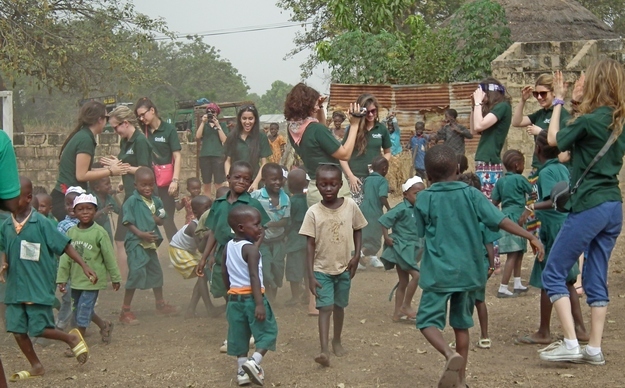 Withington Girls’ School has been supporting the education of children and adults in The Gambia through their continued links with the Mama Tamba Nursery School and various literacy programmes since 2004. The girls spent months raising money for their trip through variety of activities including a sponsored climb, Zumbathon, Themed Meal, cake sales, and a Khandoker charity fundraising event , raising over £4000. The next Gambia expedition is already in the planning and our Gambia appeal can be added to using this Just Giving Page.